Doctors and Nurses stand knee deep in Life and Death every single day. And sometimes, it’s their lives that are at risk! 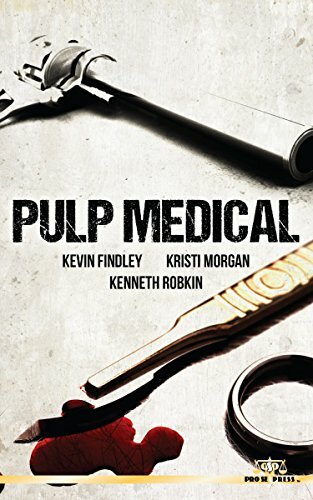 With a fantastic cover and logo design by Percival Constantine and print formatting by Antonino Lo Iacono and Marzia Marina, PULP MEDICAL is available for $10.00 in print at https://www.amazon.com/Pulp-Medical-Kevin-Findley/dp/1548508276/ref=sr_1_1_twi_pap_2?ie=UTF8&qid=1499808523&sr=8-1&keywords=pulp+medicaland in Pro Se’s own store at www.prose-press.com. This collection of Medical Crime, Noir, and Adventure is also available as an Ebook, designed and formatted by Lo Iacono and Marina for only $2.99 at https://www.amazon.com/dp/B073TMVTMR/ref=sr_1_1?ie=UTF8&qid=1499808523&sr=8-1&keywords=pulp+medical and is available for free for Kindle Unlimited members.